Activision, Microsoft and Turtle Beach could face lawsuits over their use of the "fictional" unit. 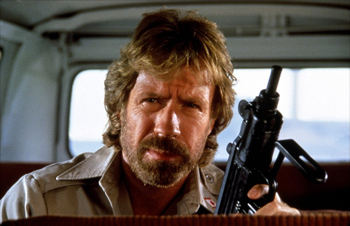 Okay, so for those of you who aren't wearing your camo-print undies: Officially, there's no such thing as "Delta Force." The term is just a popular, slightly-less dull name for the 1st Special Forces Operational Detachment-Delta. As no official military unit uses the name, NovaLogic managed to trademark the term, along with a stylized version of the 1st SFOD-D logo, back in 1998 for its series of millitary shooters. Activision uses the Delta Force name, as well as a similar logo and has characters referring to "The Unit," the term 1st SFOD-D members use to refer to the outfit, in Modern Warfare 3. Novalogic asserts that this is a violation of their trademark. NovaLogic states the mark is "for use in connection with computer software featuring simulations created through graphics, computer game software, pre-recorded CD-ROM compact discs featuring computer games, hand held units for playing computer games, accessories for hand-held units for playing electronic computer games, namely computer game joysticks, manuals and strategy guides." Now here's where things start to get complex. Activision hired a former Unit member, one Thomas 'Dalton Fury' Greer, to ensure MW3 featured totally authentic uniforms and military gibberish. Greer himself wrote a novel, cheerfully entitled "Kill Bin Laden," which features a stylized version of the Unit logo on the cover. That logo just happens to look very similar to NovaLogic's version. Vivendi, who owns Activision, previously licensed NovaLogic's trademarks for use in a game. Meaning it was well aware of NovaLogic's trademarks. NovaLogic claims that Activision has ignored two cease-and-desist letters sent last year, and the developer is now seeking damages and an injunction for trademark infringement. Microsoft and overpriced headphone pimps, Turtle Beach, both produced MW3-themed merchandise that bear the Delta Force name, and the distinctive logo, which I'm told you're not supposed to call the "knifey triangle." If NovaLogic's claim is successful, those products would likely be deemed in breach of trademark law. A company known for producing silly military shooters on a yearly schedule is being sued by a company known for producing silly military shooters on a yearly schedule? This is the legal equivalent of a visit from the Ghost of Christmas Yet to Come. Lovely.